We love this hotel and are returning in 2011 for out 3rd visit. The staff cannot do enough for you. My sister and her family were coming out for our 2nd week and reception made sure they were in the room next to ours with no hesitation. My Mum came out the week after we returned and they made such a fuss over her- it made her holiday. The pool area is cleaned first thing in the morning and last thing at night. The rooms are very spacious and clean. The food is varied buffet style with plenty to choose from - fish, pasta, salad, meat dishes etc. And cakes to take you to heaven and back! Breakfast is buffett too, continental/English. The location is ideal although you won't get a sea view. 5 minutes one way and you are in centre of Cala D'or. 15 minutes stroll the other way and you are at the Marina, very nice setting for a meal. Acuarius is our favourite restaurant at the Marina. In Cala D'or itself there are plenty of bars and restaurants to choose from. The Kalypso Tutti Frutti bar is our favourite - Oscar & Nikki make you so welcome with their volcano cocktails and there is a very cheeky parrot called Guapo. Kids love him! Such a lovely place to watch the world and just chill! Children’s entertainment and club is very good, my 6 year old loved it. Evening entertainment consists of kiddie disco and then adult cabaret after that. Clientele exist of Dutch, German, and English and last year a few American accents were heard too. Can't wait till August when we will be back again! We stayed at the Sa Marina in a one bedroom apartment, self catering. I had read many reviews on this hotel before booking and I have to say this hotel certainly does live up to all those positive reviews. It's ideally situated only a stones throw away from the town yet it's in a very relaxing and peaceful location. 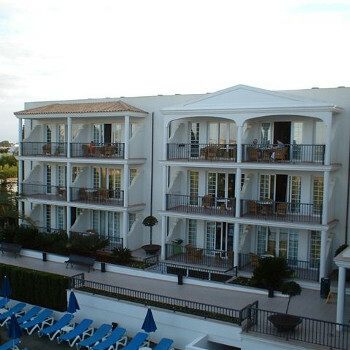 The rooms are immaculate as are the public area's, including the swimming pool's and sun loungers. We came across maids cleaning area's gone 11pm of an evening. All the staff are extremely pleasant right down to the maids. The only downside to this hotel is the sunbed issue, isn't it always? The first pool which is situated in the main block by reception is taped off until 9am, though the odd one or two guests did go under the tape and sit with sun loungers. A queue would normally start to form around 8am so be prepared for an hours wait. The second pool area which is the busiest of the two pools doesn't get taped off so you can get your sunloungers as early as you wish but by around 8am they are all taken so this is a bit of a bind when you're meant to be having a relaxing break. Beware also that if you leave towels on loungers unoccupied you run the risk of having them removed, we witnessed this a couple of times, not only by staff removing them but by hotel guests. It's just a shame that hotels never provide enough loungers for the amount of guests staying there. The animation team keep themselves busy in the day running the kiddies club and also trying to get guests to join in different activities such as darts, waterpolo and rifle shooting. You don't feel badgered by them and we found them all to be extremely pleasant and hard working. My teenage Son had a fantastic time playing the adult waterpolo of an afternoon and I have to say there was a really nice atmosphere at this hotel amongst the guests, everyone was very friendly and there was a good mix of nationalities. There was also a good mix of families and it was nice that there were families with older teenager's which was great for my Son as he's very sociable and enjoys making new friends. I found the evening entertainment a bit of a let down for a 4* hotel but the animation did work hard to try to please and this is no way spoiled our holiday. Everything shuts down by midnight so you get a good nights sleep. I would definately go back to this hotel, infact most of the guests we spoke to were on the 4th or 5th visit, I think that says it all. We stayed here for two weeks, myself, my husband and 12 year old daughter. It is lovely self-catering accommodation. I have never stayed anywhere so clean, there were maids cleaning all day and in the evening, and it showed. It is immaculate. Our apartment was in the block where reception is located, there are 3 blocks. I had asked for a top floor room and we got it. The only down side was that we were given a room overlooking the main road, which was a little disappointing. However when inside the traffic noise was not a problem, you could hardly hear it. When sitting outside it could be very load at times, but we put up with it. It did not spoil our holiday, and at night we got to hear some of the music in the distance from "The Square" which we liked, didn't go on too late either. Some of the rooms overlooking the pool/bar area could I imagine be equally loud in in a different way. The apartment was nicely furnished, the beds were comfortable, and it had a nice bathroom. Kettle and toaster provided, but no microwave, which would have been handy.The two pools are lovely, we stayed around ours near reception as that was the quieter one of the two. We always got a sunbed which was down to my husband getting up in good time, but you could not reserve them and they were being cleaned until about 8:45 anyway. I did notice that in the afternoons they soon become available, as lots of people left to go out, go to the beach etc. There are also some sunbeds in front of the second block between the walkway to the two pools. These are under some trees, so nice and shady, but they don't have cushions so only for a short stay really. However as it was very hot we did use these for a welcome break some days. There is entertainment every night if you wanted to sit and watch it. We used to go and have a look when we got back from eating out now and again.Not really our thing, but did enjoy what we saw. Didn't try the food so can't comment on that, but I imagine it was good as lots of people did use the restaurant. The apartments are in a good location, two Spar supermarkets in either direction, very close by. They had everything you wanted. Mixed nationalities staying at the apartments, but mainly English and German. There were two computers in the bar area which has the internet if you wanted it. Our daughter used it a few times to keep in touch with her friends, as they do. This kept her happy. The nearest beach is the Cala Gran, which is about a 7 minute walk away. There are others further along if you want a change.Overall we really enjoyed our stay, they could not do enough for you. Everyone said hello to you, and so polite. Lovely place to stay. Would we go back? Oh YES, most definetely. Plus points: Lived up to its name and stars. we have just returned from the sa marina ,what can i say ! fantastic hotel ,fantastic location , fantastic staff ,please ,please go there ,if you have children (ours 9 and 5 ) made friends straight away ,very relaxed and friendly place to stay . we went to florida last year and i can truely say that it was on par with it !!!! Just got back from a most memorable holiday apart from the weather! Sa Marina is the best place we have ever stayed at. It was so clean, lovely spacious apartment, cleaned every day but Wednesdays. Not far to walk to the lovely Cala Gran beach and the best restaurants are Can Trompe and Barlevento and the best bar is the one next to Can Trompe. Very large drinks!!! Cant wait to go back, I would highly recommend this place. 3rd block is up and complete along with a new pool,bar and outside stage for the entertainment. We were more than pleased with this being our 3rd visit.Same staff all round which is nice to see,everyone I meet were more than pleasant. Sat by the new pool all week,didnt venture to the old pool,plenty of sunbeds,the staff still take away your towell if you leave it before 9am so be warned! The entertainers at night were good espically with kids. The food was excelllent and there was plenty of choice every day. Stayed at this apart-hotel twice now and it is second to none. The only unfortunate thing for us is how popular it has become making it even harder to get a sun-bed around the pool. If you haven't got one early, its a day on the beach - also very crowded - but do try the pineapple from the fruit seller (sweet). The hotel is ultra clean and is a real step up from your normal self catering style accomodation. The in house entertainment is fab with the hotel reps (not too pushy) having a full list of decent things for kids and adults alike to stop boredom setting in. Particularly recommend the Adults water Polo game each day where the oldies like to show off their prowess with plenty of under hand & underwater dirty tactics - all in good fun. 10 minute walk to the marina where you'll find restaurants to suit all tastes and all pockets. Nice resort with very few (if any) lager louts to spoil it for others.